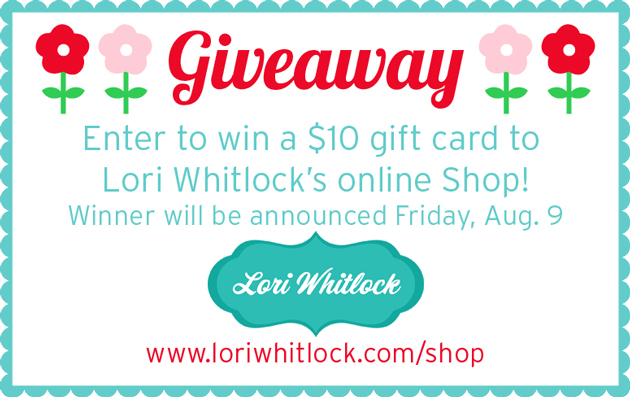 Welcome to Lori Whitlock's Summer blog hop!!! If you're hopping along you should be arriving from Corri's blog (or you can start from the beginning HERE). 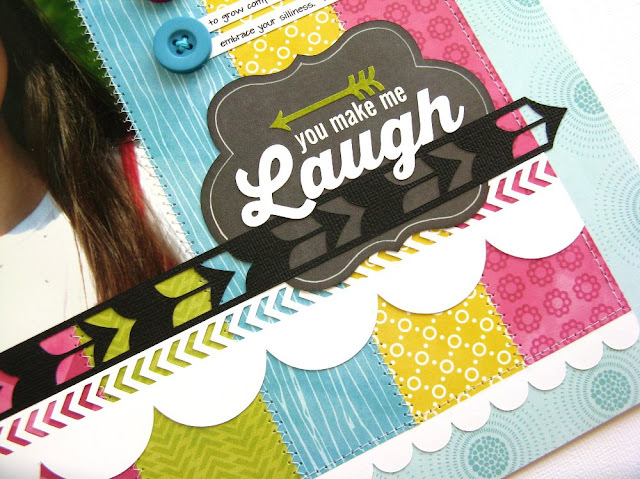 Today I have a fun layout featuring the Here & Now collection that Lori designed for Echo Park along with NINE of her cutting files! I paired a fun arrow with her rosette shape which I then topped with a sticker from the collection. For my rosette, I chose the "release compound path" function and deleted the perforated fold lines. Lori designed these to fold perfectly on the 1/4" mark so as an alternative I used my Martha Stewart score board, scoring in half inch increments on one side and then turning over and scoring one 1/4" over every half inch. I layered a couple different tabs from her 7 Tabs set, adding a butterfly sticker from the collection to add a little interest to my date and form my visual triangle for my layout. For my label I used chalk board patterned paper and cut a second smaller label from scratch paper which I used as a tracing template with a white gel pen. I then topped it with one of Lori's awesome titles cut from white cardstock for the word "laugh" and using white vinyl for the smaller words (which may have been hard to cut and glue from cardstock due to their size). Absolutely love this layout!! You've used such wonderful colours and embellishments. It totally sets the scene for your great photo. How come when I had braces during my teenage years I didn't look this cool??!! What a super cute layout. I love the journaling you did. Great job!! Great layout! You've used Lori's designs perfectly! Thank you for the inspiration. I love the paper used on this layout! The buttons with the journaling were just the perfect touch. Mendi this layout is beautiful!!! I love the photo of your daughter... she's so pretty and this layout definitely captures a defined moment in her life. I love the colors of the papers and all those pretty borders and arrows! Cute page. I love the stitching detail and how your title overlaps one of the borders on the bottom. Thanks for the chance to win. Hello! I already am a follower of the blog and on FB- I also follow you on feedly- I love your design style!!! Thanks for the chance to win! Your layout is gorgeous and WOW...nine files! LOVE the layout! Thanks for the chance to win!! Great inspiration! I LOVE your layout! 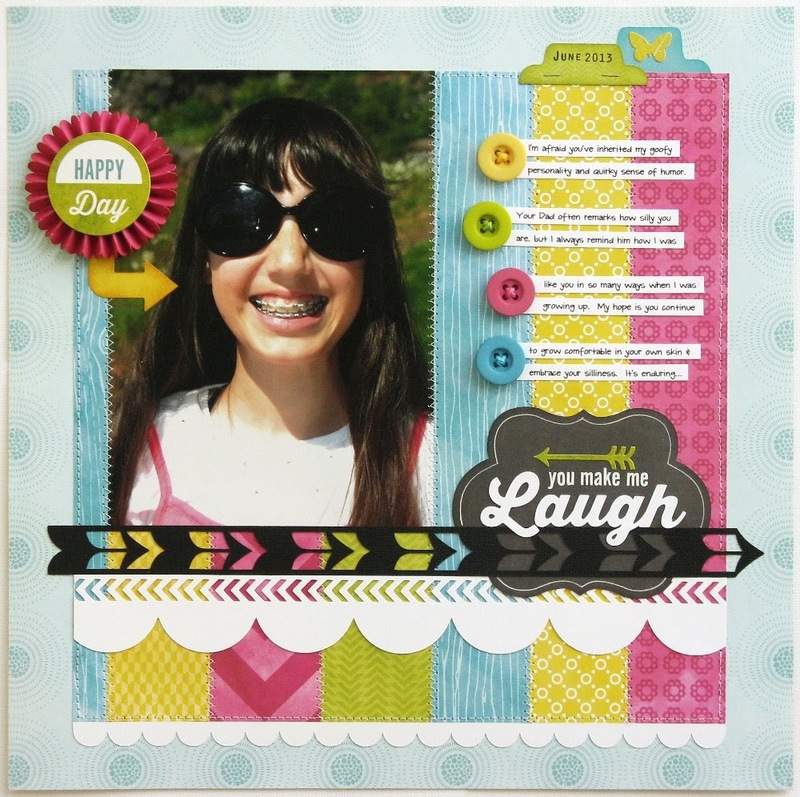 I enjoy seeing people use their cutting machines to create layouts that are fun and trendy. You did a great job! This is so awesome!! You always make the best pages, I need you to come help me do mine! Love your layout! The stitching looks fantastic! Thanks for the giveaway! your work is lovely- I'm especially drawn to Lori's 3d designs- I have many of her flowers! Great layout! Love all the die cut details! Beautiful layout! Thank you for sharing. I love the colors of your layout! Beautiful picture! Great LO!!! thanks for great ideas! As everyone else has commented, that is a great layout. Thank you for sharing. I've already liked Lori's FB page and am a follower of her blog. Beautiful page layout! Thanks for the giveaway. Love the scrapbook page. Love the way you the tabs, and buttons. Such a fun happy page! Love the colors you used, the buttons, and the fun title! Love! An awesome way to make a girl who is growing into a young woman feel special! The in between years can be awkward! Inspired me to try this for my daughter. Very cute page. Much better then cutting by hand. Wow what a great layout!!! The colors are awesome. Love the here and now collection!! Great layout with such fun colors and accents. What a beautiful layout, so bright and cheerful! I love your layout especially what you wrote to her. TFS. I always love your layouts and this one is a great one! Thanks for sharing! Such a fun layout. Love the design & colors. Beautiful little girl! What a beautiful layout!! LOVE the colors! Love your awesome layout. Thank you for the chance to win. What a sweet layout for your daughter. I always love seeing your layouts Mendi, this is so pretty!! your Layout is so pretty!! very fun and cute layout. I like the colors and your use of buttons. Awesome layout and the colors are so vibrant. Thank you for sharing. i love it! thank yo for sharing your beautifu creations. i am learning so much by following you all! Great layout! and lovely color combination! Love the stitching and great colors. Using buttons as bullet points - I'm going to use this on my next layout. Thanks for the inspiration! I love this layout! 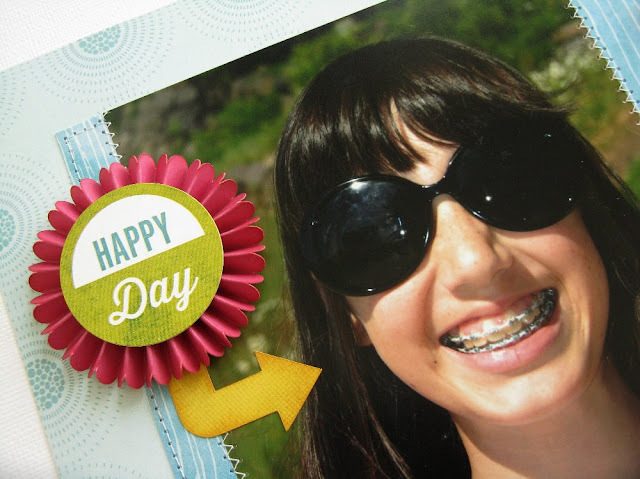 I don't yet have a Silhouette and is so nice to see how it can be used for scrapbooking too! So cute Mendi...love the pieced background and the cute rosette flower!